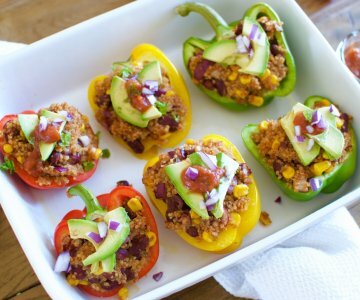 Spicy stuffed peppers - delicious, healthy and plant based! Hi lovelies! 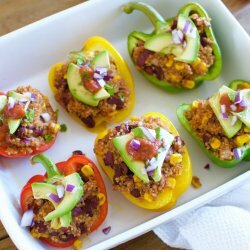 I am finally able to share another recipe with you guys! As I have mentioned before, I have so much going on right now (I am so happy and excited, but also a bit of a stressed and nervous wreck), which makes it hard to keep up with the blog, but whenever I have a little extra time, then I promise that I will do my best to update the blog. Some of you have been asking about my January Challenge, it is still going strong, I have had two slip-ups so far, but I strive for improvement and not perfection, so I am not beating myself up. The first slip up was that I ate the fries that came as a side when I was out for lunch with a friend (I mean, saying no to fries?! haha, not gonna happen!) and the second slip-up was that I completely forgot to work out the other day. I usually work out in the morning, but I wasn’t feeling well so I decided to do it later in the day and ended up completely forgetting all about it. I am loving the challenge so far though and I think it is going well, I have been drastically upping my intake of green, veggies and legumes (I already ate enough fruit), I have cut out the processed foods and I am slowly getting into a sustainable healthy routine. Make sure to try my candy popcorn and dark chocolate/peanut butter drizzled popcorn as well! Start by melting the coconut oil in a large pot on high heat. When the coconut oil is melted and the pot is hot, then you can add the corn kernels as well, top it with the lid and wait for the corn to start popping. Once the kernels starts popping make sure to vigorously shake the pot back and forth over the stove to ensure that you are not burning any kernels, this will allow the already popped kernels to float to the top. Continue to do this until all kernels have popped. Take the pot off the heat and quickly drizzle the popcorn with the olive oil, stir to coat the popcorn in the oil and then add the nutritional yeast and spices as well. Make sure to stir well to make sure the popcorn is properly coated. Pour the popcorn into a bowl and top it with the spices and nutritional yeast that have fallen to the bottom of the pot. Enjoy! Lækre popcorn – har selv prøvet dem. Kan stærkt anbefales.